Visual artist Bronwen Bradshaw was the first Palace Intrusions artist in residence, producing a series of photographic panoramas and friezes of the Bishop's Palace walls and moat in Wells. The first public event of the project was a participatory drawing day led by Bronwen, working with local people and coinciding with the national drawing scheme 'The Big Draw'. The intention was to create a large collective panorama of a view of the moat and walls. The public drawing day took place on 24th October and resulted in three complete panoramas and one frieze, created by 51 visitors to the project and witnessed by many others. For photos of the final panoramas see 'Exhibitions'. As lead artists of ‘Palace Intrusions’ our intention is to enchant, surprise, provoke and generally endear ourselves to the people of Mendip. We will do this by producing a variety of events and artworks on and beside the benches by the moat in Wells and during the coming year we will be writing a monthly column in the pages of the Fosse Way Magazine. It was a cold and misty morning by the Palace moat in Wells. We had no idea how the day was going to pan out, but by the time we’d finished setting up we found ourselves transported into a perfect crisp and sunny day with the kind of light which makes you feel you are in a painting. We had set up five easels beside the moat in preparation for the public and we were ensconced in our green and white Palace Intrusions gazebo. The event attracted around 150 visitors - local people, tourists and artists. Most people participated directly by taking a place at one of the easels and drawing a section of the panoramic view. By 2 o’clock we had produced three complete panoramas, each made up of fifteen sections and a seven-piece frieze of the palace walls. We wanted to encourage an atmosphere of concentration, focus and attention. This is difficult to achieve in a busy public place with a group of people who don’t know each other but our aspirations were exceeded. The people participating in the drawing seemed to lose themselves in the act of capturing the scene in front of them. Fosse Way Magazine, 9 November 2007 - one of a series of essays published throughout the year. Bronwen Bradshaw is an artist who works with print, artists’ books, video and photography. Her work is inspired by music, movement, memory and events. She is also an experienced teacher who has taught children and adults for many years. Drawing, and close observation of the inner as well as the outer landscape are central to her working methods. It was our intention as curators of Palace Intrusions to offer the community a wide range of arts experiences. For Benchmark 2, Melanie Thompson and Jane Hazlewood offered the visitor a different way of participating. Over the five days they made subtle alterations and intrusions in the area beside the moat. Each day this familiar place with its benches, used by many people, went through a minor transformation. Benchmark 2 was a site-specific response to the actual benches surrounding the Bishop’s Palace moat. Melanie Thompson (installation artist) and Jane Hazlewood (sculptor) were resident throughout the week but special ‘interventions’ in the form of live performance and installations on the benches happened between 1.00pm and 2.00pm on Wednesday 21st to Sunday 25th of November. These interventions took the form of ‘still lifes’, held moments, each titled as if a photograph or a painting. Each day two ‘still lifes’ were created and performed by Melanie, sometimes connected by a journey in a large moving house. Every day at 1 O-clock we left the Palace grounds to promenade along the moat pulling a large white muslin and bamboo house on wheels. Each day the sun shone (which is quite extraordinary considering the month and weather forecast). Once I had made my picture on a chosen bench I became part of it and sat or lay in complete stillness for 15 mins, creating an alternative still life. Either Jane (who constructed the house) sat and drew me or Helen videoed me before I packed up and moved on to make a 2nd image further along the benches. At the end I slowly returned to the palace. Full circle, one hour. I am interested in the unexpected, the things that surprise you and pull you out of your everyday existence into another place, a place of imagination and dreams. That is why I work outside the theatre and the art gallery to offer work to people who maybe feel they know nothing about Art. Of course the reactions are always mixed as they were over these 5 days of performances. Some people just tried to pretend I did not exist, some laughed, some stayed and looked. Many were interested but were not quite sure how to interact. All these responses are valid; some commented, “she looks asleep, Is she really asleep? One child asked her parents, “Is she dreaming”? That is enough for me. Fosse Way Magazine, 7 December 2007 - one of a series of essays published throughout the year. Jane Hazlewood is a painter, sculptor and more recently through collaboration has created videos, objects and sets for performances and 'special events’. Jane has been making work for exhibition for the last 20 years. Living locally, Jane is not only an experienced artist but also a G.P. This combination brings together a deep understanding of the area and the people who live in it. In 2000 Jane collaborated with Melanie Thompson on a one year event entitled The Scallop Project. This project was based in a small village in Somerset which culminated in a days event where Jane’s sculptures and objects and videos led the audience through the past, present and future of this Pilgrim’s village. This is the 3rd project Melanie and Jane have collaborated on. With Christmas approaching, Benchmark 3 was conceived as a magical journey by twilight with music, stories, coracles, and origami swans and boats. Helen Ottaway’s music was performed by three trumpeters from the ramparts of the Palace walls. Melanie Thompson wrote and narrated the story and acted as guide for the audience. Everything in Benchmark 3 was designed to draw the audience around the palace Moat, circling the Palace walls in a slow procession. Melanie Thompson's unfairy story opened and closed the event, describing events past and present, imagined and real and leading the promenade into the twilight; origami swans perched on the surrounding benches; coracles led by the Bishop's swans slowly paddled their way around the moat as the sun set, moving imperceptibly from daylight to lantern light. A girl, the subject of the story, could be glimpsed making her way along the walls with a lantern, following the coracles and finally disappearing into the night. Benchmark 3 was co-directed by Helen Ottaway and Melanie Thompson. The Music was specifically designed for the space: trumpets were chosen for their ability to carry over distance; for announcing the celebratory event, for splendour and for mystery. The three trumpets performed from the ramparts of the Palace walls, sometimes together on one turret, sometimes calling to each other from remote positions on the walls. The piece begins with a Fanfare calling the boaters, the story teller and the audience to start the promenade. Repetitions of the fanfare also serve as punctuation throughout the event. Swans is a stately processional piece for the three trumpets played together from the first turret accompanying the walk along the first length of Palace wall. The third section, Coracles, is a duet between two trumpets, a musical conversation, highlighter by single haunting trumpet blasts from the third, now distant, musician from the second turret. The final section, Round, is a dance played by all three trumpets, one in each of the three turrets. perhaps this is the music for the dance which follows the feast described in the story or perhaps a dance to entertain the guests. Once upon a time a long time ago (1337 to be precise) a great banquet was held in the new banqueting hall in the palace behind us. It was a sumptuous affair; the 268 guests were offered 672 loaves of bread, a whole sheep, half a cow, a duck, chicken, and endless types of fish, bream, hake, pollock and eel as well as 86 pipes of wine and 340 pipes of beer. Among the guests was a girl; she was the daughter of a musician, a trumpeter. It was now late at night and she had fallen asleep amongst all the remains of the food and drink in front of a huge roaring fire. She was outside the palace flying above it and looking down at where the moat should be. First she dreamt of prehistoric times when the wooly mammoths and the hyenas and bears and bison would come out of the forests to the natural watering hole which was later to become Wells. She heard the animals whisper to each other a ‘good place to hunt and a good place to be hunted’. Then she shifted her gaze and she saw the moat was built and it was full of fish, carp, sticklebacks, and on the surface kingfishers. 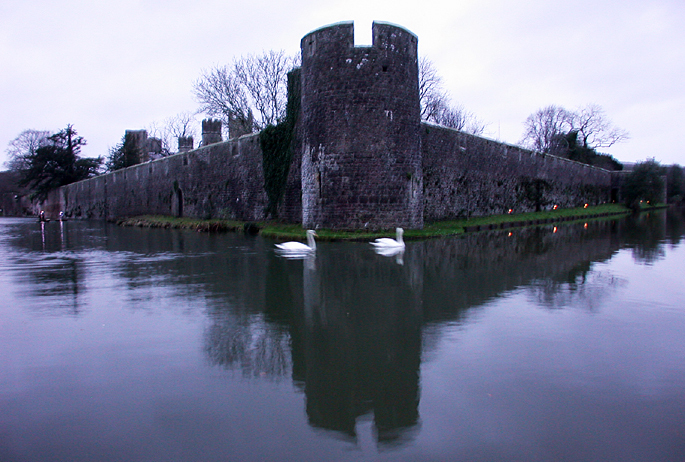 Slowly coming towards her were 2 huge white swans, they went to the wall of the moat and with their beaks and pulled a bell that rang out through the night. Then they turned their gaze upwards and said in clear voices “men are in the water now with lights and we can hear magical sounds follow them, follow them for us." She then saw 4 coracles disappearing into the darkness, where were they going? could she stop them? She rubbed her eyes, was she still dreaming? She had to find out where they were going, into the future perhaps? The day of our third Palace Intrusions event was memorable in more ways than one. It was a disgustingly wet, windy, and as it turned out, muddy day. When you are planning an outdoor event you follow the weather forecast with fingers tightly crossed. We had had amazing luck with the weather for Benchmarks 1 and 2: stunningly crisp and sunny autumn days providing a brilliant backdrop for our activities around the moat. Was our luck about to run out? Saturday 8th December came and it rained and rained and rained and then our gazebo blew down and everything got covered in mud and we thought “this will be a wash-out - no-one will come, the musicians and boaters will get soaked”. And then the first miracle happened: 3 o-clock came and the rain stopped and the sun came out - just in time for trumpet practice on the Palace ramparts. 4 o-clock came, the appointed hour, people gathered, we had an audience and it stayed dry. Melanie began the event by delivering the first part of her un-fairy story through a megaphone, positioned on the moat landing stage surrounded by origami boats. The coraclers were in the water ready to set off round the moat, the trumpeters were on the ramparts waiting to offer up their first fanfare into the darkening air. Then a second miracle happened: the Bishop’s swans glided into position and began to lead the flotilla of coracles on their voyage around the moat. We had promised a magical moment, something to savour through the winter months, but this was something way beyond our design, something totally unexpected and miraculous. I had noticed the swans being particularly attentive when we had been rehearsing the trumpet music. They were obviously taking everything in, preparing for their role in the pageant about to unfold. As the assembled crowd followed Melanie along the moat path and dusk fell slowly lit by our torches under the Palace walls, people were heard saying, " that's amazing, how did they get the swans to lead the performance? " By now the promenaders were on their way around the moat drawn along by the coracles and the trumpets’ haunting refrains. As the music grew, with fanfares and melodies echoing along the walls, the walkers swung around the corner to see ducks fly across the beautiful panorama of the Wells parkland, swept by the last light of the sky. The atmosphere was full of magic as Melanie read the final piece of the story and night fell, while the coracles disappeared into the Palace grounds followed by the girl in the story. We had intentionally set out to create something ethereal and otherworldly with this event. As has been the case with each event so far, we wanted to give people a different view of this very familiar landscape and to feed their creative imaginations. The place we have chosen to locate our year long project is a place for people but it is also a place full of nature. We have been very fortunate that the forces of nature have looked so favourably on us and given us so much help. On Saturday in Wells a band of intrepid thrill seekers gathered beside the Bishop’s Palace moat taking advantage of the break in the rain which had fallen so relentlessly all day threatening to wash out the billed event ‘Benchmark 3: Coracles on the moat with music by Helen Ottaway’. This left a cold but clear late afternoon and as the light began to fade so we were urged by a beguiling storyteller with a megaphone to “gather round” and within seconds we were transported to an earlier more magical time when people knew how to prepare for the coming of Midwinter by holding a sumptuous feast. This was described in mouth-watering detail and just as this image was crystallising in your mind so others rushed to replace it: inquisitive young girls, coracles (round boats) and a mystery. The atmosphere was completed when a compelling (and infectious) refrain bore down upon us from a trumpet high on the ramparts and was picked up like an echo by a second more distant trumpet and suddenly we were on our way. As we quite literally followed the story in a gentle procession around the palace accompanied by the skilled boatpersons in their tiny boats the light began to fade only to be replaced by candlelit lanterns hung along the outer walls while glimpses of characters were snatched from Palace windows as we journeyed through the short tale until we reached the farthest corner and the poignant final image of a young girl walking away from us into the darkness.......but that’s another story. What a perfect antidote to the tawdry seasonal shop fest and jaded rituals that awaited us when we stepped back through the gateway into the 21st century. This was the real thing: lights, music, good company and magic. A faint memory of being a child again, holding on tightly to a parent in a crowd in the dark, as you walked along bewitched by the lanterns of carol singers and the mesmerising Christmas music. 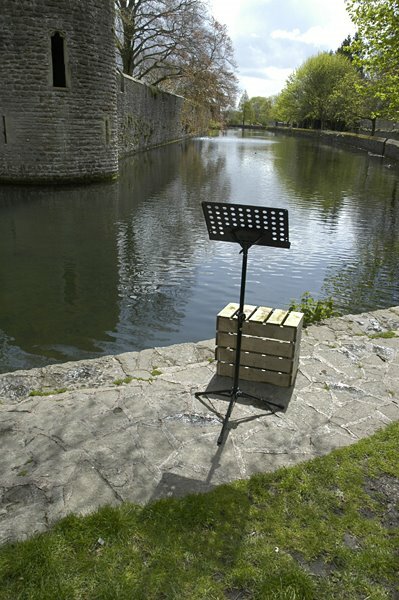 This is the third in a year long series of Artmusic events around the moat and benches outside the Bishop’s Palace under the catchy title of ‘Palace Intrusions’ and if the others are anywhere near as good then it would be a crime to miss them. For more information about Melanie Thompson and Helen Ottaway click here. With an atmosphere reminiscent of Speaker's Corner at Hyde Park in London and a prayer meeting on the village green, this was an event for all the family. Each guest spoke for 20 minutes and there were opportunities for questions and to meet the speakers afterwards. Should Wells be a World Heritage Site? Why are lichens so interesting? Over a weekend of classical English summer sunshine and showers, six people stepped up in turn to an al fresco podium set up beneath the ancient yew on Bishop's Green. On the Saturday there was a conductor, a conservationist, and an archaeologist; on the Sunday, a bishop, a botanist, and a sound artist. A third day might possibly have included a butcher, a baker, and a candlestick maker. Next time, perhaps. Foreigners on the tourist trail of the Moat Path or the Bishop's Palace must have acquired a nicely skewed understanding, that weekend, of our native traditions, when, apparently, our open spaces are regularly occupied by such eminent individuals freely sharing their thoughts with passionate and infectious enthusiasm to anyone who might care to stand and listen. Following his studies at Christ's Hospital and Oxford University, Charles Hazlewood was nominated by the BBC as the UK's sole representative in the European Broadcasting Union conducting competition in Lisbon. He won first prize and following this success he has established himself as one of Britain's most exciting young conductors. He is currently Principal Guest Conductor of the BBC Concert Orchestra, with whom he made his debut at the BBC Proms in 2006. He brought the National Youth Orchestra of Great Britain to the 2007 Glastonbury Festival, making history in performing the first ever symphony concert on the world-famous Pyramid Stage. Artmusic is delighted to have Charles Hazlewood as Patron of Palace Intrusions. Ian Constantinides trained as a materials scientist with the Atomic Energy Authority. He started St Blaise Ltd in 1980 to conserve historic buildings by combining the skills and philosophy of the conservator with those of the traditional roles. Mark Horton is an archaeologist and Head of Department of Archaeology and Anthropology at Bristol University. He has lots of interests, Africa and the Caribbean, maritime landscapes and academic issues of presenting the past through TV and Radio. He has presented and co presented ‘Coast ‘, ’Time Team’ and ‘Inside Out ‘. He worked on excavating the Bishop’s Palace in 2002 and has been involved in numerous projects in Wells and Mendip over the last 15 years. Peter Price was appointed Bishop of Bath and Wells in the summer of 2002. He has broadcast regularly on BBC World Service and Independent Radio in London, has contributed to a series for BBC Radio 2, and has been grilled by Jeremy Paxman on Newsnight. Bishop Peter has a particular interest in small Christian communities and contextual biblical reflection. He is active in issues of reconciliation, and has made contributions to peacemaking in Northern Ireland, Iraq and Zimbabwe. In 1999 he was awarded the Coventry Cross of Nails for this work. A core team member of 'New Way of Being Church,' he has recently published with Jeanne Hinton, Changing Communities - Church from the Grassroots; and among his other books are Undersong - Listening to the Soul, Playing the Blue Note and Seeds of the Word. President of the Lichen association. Pat is a botanist at the Natural History Museum, London. 30 years ago she started working on lichens, at first in this country then expanding to the tropics. Since then she have worked in remote places of Thailand, Kalimantan, Malaysia and more recently Sri Lanka using lichens as indicators of environmental health. Since 2003 she has been working in this country where she has been developing bioindication techniques for nitrogen across the UK in conjunction with the Centre for Ecology and Hydrology. Duncan Speakman is a sound artist based in Bristol, UK. His work examines how we use sound to locate ourselves in personal and political environments. Seeking out the poetics of the everyday, he creates socially relevant experiences that engage audiences emotionally and physically in public spaces. He has been exhibited internationally at festivals including ISEA, Futuresonic, ArteAlmeda, Navigate, InBetweenTime and Xtracts, and has created pieces for a number of large scale site-specific events. In 2002 he was awarded the Clark Trust Bursary for Digital Arts he has received critical acclaim for his videoblog 29fragiledays. He is a senior lecturer in media practice at the University of the West of England and is currently developing site-responsive soundwalks. Benchmark 4 was supported by Waterstone's Bookshop, Wells. In the months prior to the launch of his soundwalk, Duncan used his residency to make a number of visits to Wells to find, record and compose his responses to a circular walk around the Palace walls. The final composition, 'Song for Fifty Hearts' was the result of 50 walks around his chosen route. On the 2nd and 3rd June we were present with Duncan on Palace Green offering passers-by the opportunity to try the walk and a chance to meet and talk to the artist. Over the 2 days about 20 people of all ages and backgrounds set off around the moat path to experience Duncan's piece. From 4th of June until the end of September The soundwalk was available from Wells Museum or as a download on the Palace Intrusions website. 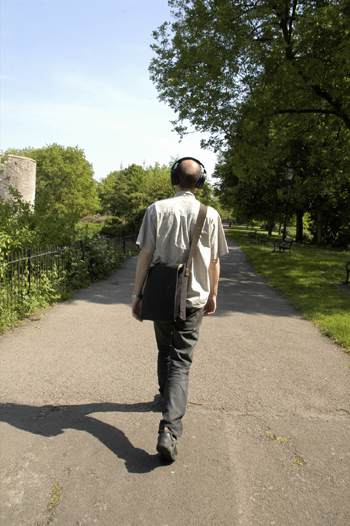 'Nationally acclaimed sound artist Duncan Speakman will create a unique soundwalk especially for Palace Intrusions and the Wells environment. He has been visiting Wells during May talking to local people and collecting material for the new work. Duncan says: "I am interested in how we use our ears to navigate; to find our way around physical, social and political spaces. I value an acoustic ecology, a heighteing of our awareness of the sounds that surround us. For this project I am creating a soundwalk to be heard on personal stereos (iPods, Walkmans, etc) while walking the perimeter of the Palace grounds. I want to give people the ability to hear further than they have before, to listen through walls, through the ground under their feet. When you take the headphones off I want your ears to be re-focussed on your surrounding, your awareness heightened." Join Duncan on Monday 2nd or Tuesday 3rd June between 1 - 6pm to experience the Moat Walk in a new way. Collect a personal stereo from the Palace Intrusions gazebo on Palace Green, do the walk and meet the artist. Fosse Way Magazine, 30th May 2008 - one of a series of essays published throughout the year. 'Soundwalk - an ethereal piece of audio art - has brought a new perspective to the Bishop's Palace in Wells. The piece is part of Palace Intrusions, produced by Artmusic. Audio artist Duncam Speakman says sound is his favourite sense and he likes to explore its effect on the public personally and politically. He explained that many ignore their surroundings and hopes his work will allow people to "step outside the social theatre". The walk runs the perimeter of the palace and takes around 20 minutes. Soundwalk starts with the artist's voice and continues with a gentle composition. Footsteps mingle with the sound of water and the boundaries between recording and real life begin to blur. Throughout are snapshots of conversations, the odd alien accent and a series of birdsong. Despite these being everyday sounds, the same effect is not gained by walking around without the soundtrack. Duncan Speakman's soundwalk composition, 'Song for Fifty Hearts', can be heard as a Quicktime audio file here (24.9 Mb). Alternatively, you may download it as an mp3 file from here (16.6 Mb). 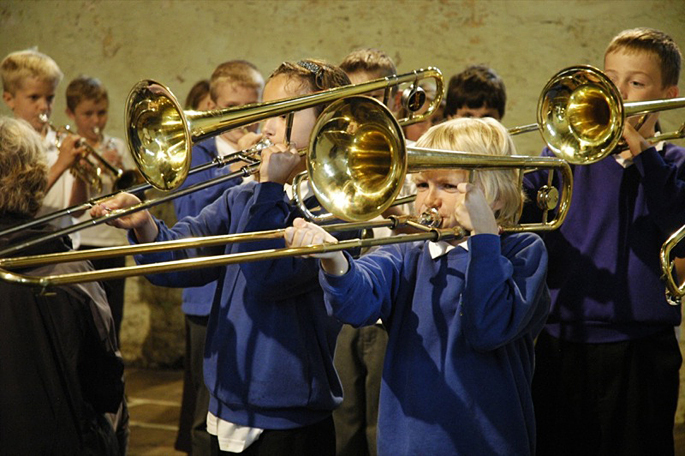 Young musicians from across the Mendip area joined with local brass players to perform a new piece of music, which stretched across areas of Frome and the City of Wells both physically and acoustically. It's a Brass Thing! was designed to provide young beginners with the opportunity to perform in a professional setting alongside more advanced student instrumentalists and accomplished musicians. Over three days more than 200 students from 10 schools took part filling the green spaces of Frome and Wells with processions and fanfares. 'This week in Frome and Wells, young musicians were on the move. "It's a Brass Thing!" 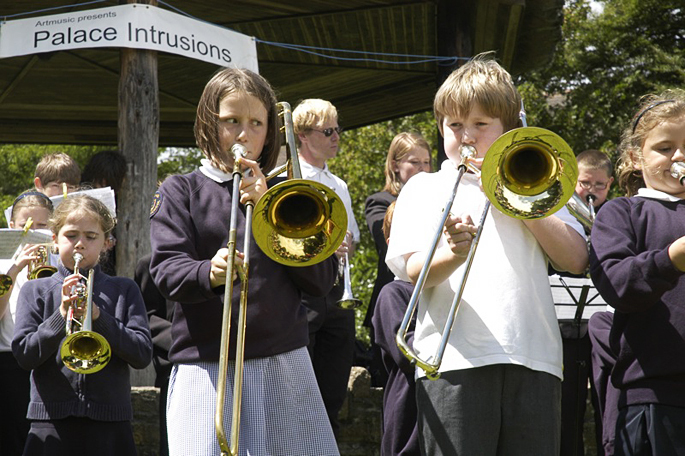 is the sixth event in the year-long arts project, Palace Intrusions, and was designed to give beginner brass players the opportunity to perform with more experienced musicians in an exciting outdoor event. Last Thursday in Wells, a large procession of schoolchildren with brass instruments formed outside the Cathedral, while another was getting ready on the Moat Path. At precisely 1 o'clock the event began: two processions made up of trumpets and trombones, each accompanied by a band of senior players and a lone drummer, started moving through the town towards the bandstand. Gradually the marchers and the music grew closer, drumbeats and fanfares approaching from both sides. It took about 10 minutes of marching and playing before the processions came face to face at the gates to the park. The music stopped and the players filed around the park to the bandstand. On reaching the bandstand the assembled players performed a short concert conducted by Somerset Music tutor Keith Thomas. Friday's performance was threatened by torrential rain and the processions, relocating to the wet weather venue, could be found marching around the inside of the Bishop's Barn. Far from being a disappointment, this alternative version was quite as inspiring as the outdoor one, with the audience seated (musical chairs style) back to back in the middle of the barn whilst the processions marched around the outside. The effect was reminiscent of an indoor parade ground or riding school, and the audience was treated to a wonderful bit of 'surround sound'. "It's a Brass Thing!" was devised by composer Helen Ottaway, who also wrote the music for the processions and the main bandstand piece. Helen Ottaway specialises in composing music for particular places and for large mixed ability ensembles. The composer said: "The children clearly had a great time taking part in the project and were really inspired by being part of such a big ensemble and by being able to perform with really experienced players. They performed brilliantly." Schools which took part were St Louis Primary School and Vallis First School (Frome, Tuesday 8th July); St Benedict's School, Glastonbury (Wells, Thursday 10th and Friday 11th July); Wookey Frst School, and St Aldhelm's School, Doulting (Wells, Thursday 10th July) and Binegar First School and Wedmore First School (Friday 11th July). Fosse Way Magazine, 18th July 2008 - one of a series of essays published throughout the year.